Kris D’Amour first featured on my blog back in 2013 when I reviewed on of their room & linen sprays. Over the last few weeks I have been trialing some of the skincare line aimed at sensitive, dry and eczema prone skin. I know many of us, me included, find the winter tough going on skin. We suffer extremely dryness and flakiness cause by central heating and that biting cold seasonal weather. With this in mind, I think *Kris D’Amour Deep Nourishing Cleansing Balm, Intensive Soothing Face Moisturiser and Soothing Face and Body Balm could help to combat dry skin issues. Deep Nourishing Cleansing Balm - this cleanser is super rich and when trying to think of a way to describe it all I can think of is putty or play-doh. It’s unlike any balm cleanser I have previously used and for a second you wonder if it will ever wash off your face but it does without residue. This cleanser is thick in texture and you need to take time massaging across the face. The best way to remove is with a damp flannel, I find I need something a little more “abrasive” than a muslin cloth. It does take a little extra time to remove but when done you’ll be surprised at the results. Skin is soft and never feels tight. What is great about this cleanser is it also doubles as a face mask. Since publishing this review Kris told me "the best way of using Nourishing Cleanser is to apply it onto wet face or mix it with water in hands, it emulsifies into cream"
Intensive Soothing Face Moisturiser – this cream has a nice consistency, it’s that middle ground between light and heavy. It feels great on the skin and I have used during the day under mineral powder foundation and overnight. This moisturiser is a blend of rosehip, avocado, sea buckthorn, shea butter, chamomile, calendula and hemp seed, perfect for dry skin. Soothing Face and Body Balm – with coconut butter and shea butter as the first two ingredients you know this product is going to be rich. It isn’t something I am reaching for at this time but this makes a perfect overnight treatment. You can use sparingly and still reap the benefits but without the heavy sticky feeling some balms can have. I will mention that all three products have a similar scent. It is a tad on the unusual side compared to other products and might not be to everyone’s taste. Initially I wasn’t a fan but I’m getting used to it the more I use the products. My other word of caution is Kris D’Amour products contain essential oil allergens so might not suit every customer with sensitive and eczema prone skin. I certainly have to monitor my use of them for this reason. Overall, a nice range of products which I envisage could be quite popular with my readers. It is also worth mentioning that the Kris D’Amour range is Vegan and Cruelty Free. 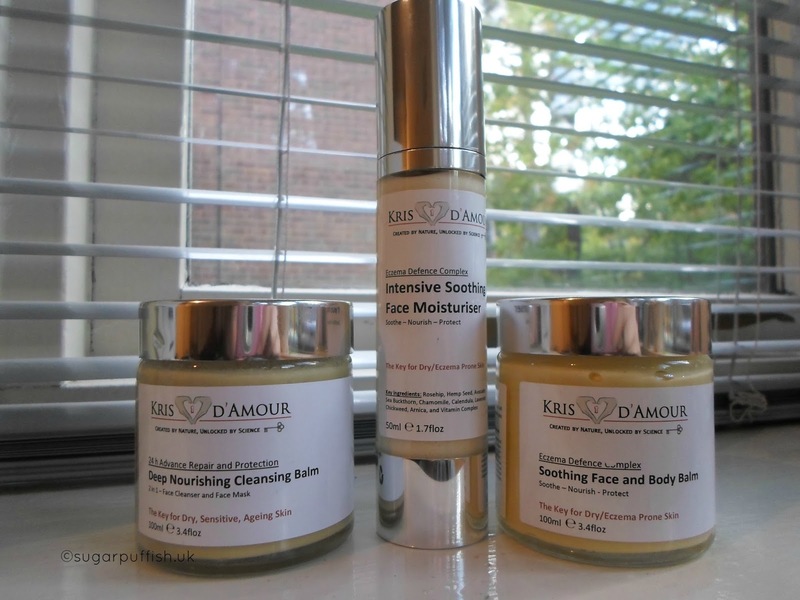 Have you tried any products from Kris D'Amour?